The challenges faced by midsize businesses remain daunting. An uncertain economic outlook, slow market growth and cost pressures continue to affect most industries. Yet, in most geographies, IT spending by midsize businesses is increasing. 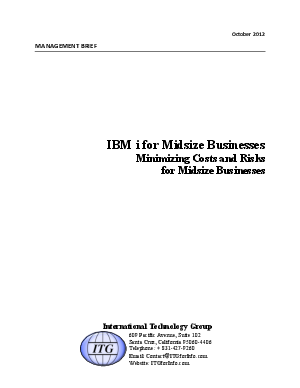 This report deals with this cost/benefit equation. Specifically, it compares the IBM i 7.1 operating system deployed on Power Systems with two alternatives: use of Microsoft Windows Server 2008 and SQL Server 2008, and use of x86 Linux with Oracle Database 11g, both deployed on Intel-based servers.